Feel the excitement only a few mountaineers have experienced on this tour. Explore the granite walls and winding glaciers in Denali National Park and climb 20,000 feet aboard a multi- engine aircraft to witness the highest peak in North America— Denali (formerly Mt. McKinley). Get a glimpse South Hunter Ice Fall and the mighty and stunning Kahiltna Glacier. You’ll witness the beginning of the West Buttress Route—the most climbed route to Denali (formerly Mt. McKinley) and her two sister peaks—Mt. Foraker and Mt. Hunter. Catch sight of North Buttress—the 4,000-foot granite technical showpiece of Mount Hunter and world-class climbing objective. 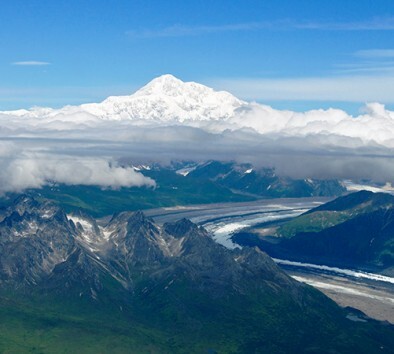 There are only two ways to see Denali Summit—climb or take this Denali summit flight…so why not take a flightseeing trip today? Minimum age is 12. Maximum weight is 400 lbs. Tour operates subject to meeting a minimum number of participants. Tour takes place in Talkeetna. Transportation to and from excursion provided by the Mt. McKinley Princess Wilderness Lodge Talkeetna Shuttle. Aircraft is non-pressurized. Oxygen masks will be provided for this tour. Flight time is approximately 1½ hours.